My friend Helen gave me a box of painted pine cones when she moved knowing I could probably make something out of them instead of her throwing them out. 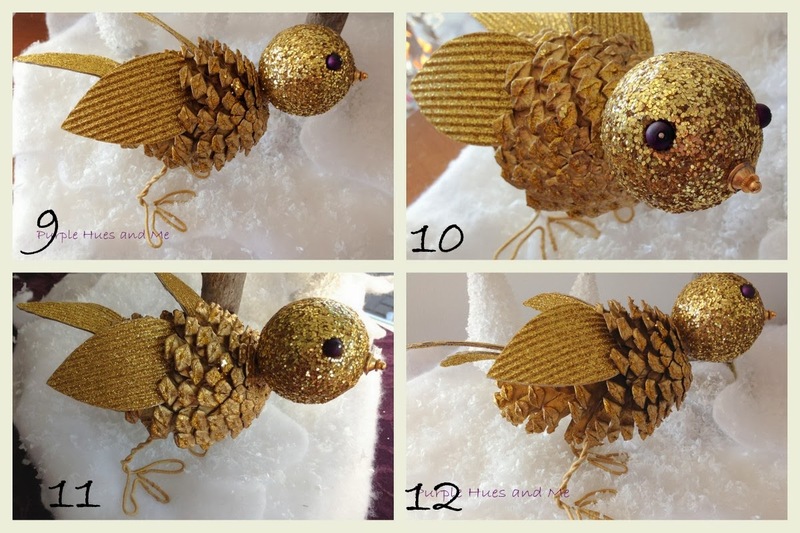 The pinecones were painted gold and I had no idea what I would do with them until I saw a group of pinecone birds on the World Market site. Although for some reason the pine cones birds are not available online. I knew it would be easy creating my version of these lovelies. 2. Coat the Styrofoam balls (for head) with mod podge and sprinkle glitter over them. Once dry, seal glitter with more mod podge to prevent glitter from coming off. Hot glue eyes and nose to head. 3. Glue head to flat portion of pinecone. 4. Cut out four petal shapes for wings and four narrow petals for tails out of the glitter cardboard. Glue two blanks sides together for the wings (2) and do the same for tails (2). 5. Hot glue wings in place. Crisscross tails and glue near bottom back of pinecone. 6. Bend 3 loops in center of wire stems for the feet. 7. Crisscross wires and wrap around each other. 8. Press the loops (feet) flat with wrapped wire perpendicular, cut excess wire. 9. Paint feet/legs gold and hot glue ends and insert into bottom of pinecones. 10, 11, 12. Admire your adorable bird! Cute little birds that are handcrafted with a pinecone body and wire feet! Add a loop and use as an ornament. This is a great craft to do with kids, not just for Christmas but during the winter months, too. Pinecones are so plentiful! Oh they're beautiful, I need to go pine cone collecting over winter for sure. Oh how cute! Yours are much cuter than the World Market ones but they were a good inspiration! Have a Merry Christmas Gail! Your friend was right! You made something really cute out of them! Makes me smile! You are such a crafting genius. I saw those adorable birds too but never connected that I could try and figure out how to make them. They look wonderful! Beautiful birds! I am pinning this for an after-Christmas craft. I think they would be great in a winter cloche. Thanks, Gail, for the inspiration. 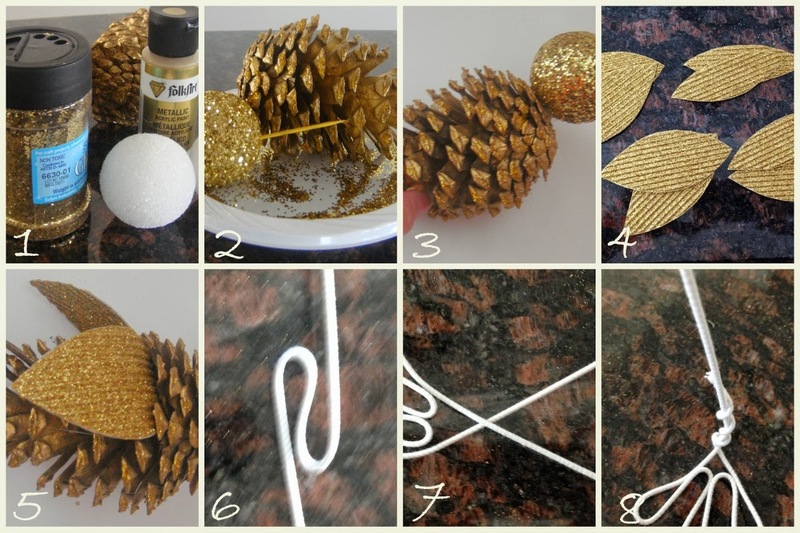 wow great post thank you for sharing this.The pinecones were painted gold and I had no clue what I would do with them until I saw a gathering of pinecone flying creatures on the World Market site. In spite of the fact that for reasons unknown the pine cones winged creatures are not accessible on the web.